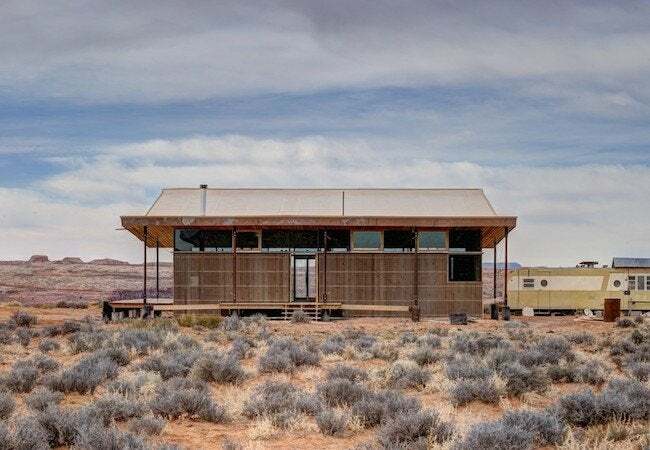 A team of students from the University of Colorado Building Workshop use their heads to shade a desert home and open it up to monumental views. Out in the blazing hot, red-tinted desert 15 miles southwest of Bluff, Utah, stands a house inspired by a wide sombrero. Three years ago, Harold Skow, a member of the Navajo Nation, leased a parcel of land from his tribe. 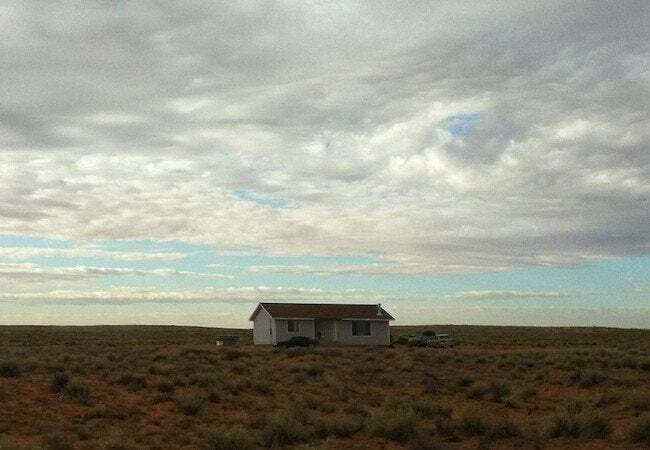 He planned to live there with his family, in a kit home like the others many Navajos occupy nearby. The Skows built the foundation, before deciding they didn’t like the type of house the kit was intended to build. They “were kind of stuck,” says Eric Sommerfield, director of the University of Colorado Building Workshop. At the Skows’ invitation, Sommerfield and a group of students visited the property, intent on coming up with a new design that would use only the materials meant for an entirely different house style. On their first visit to the site, Skow showed everyone around. “He was wearing a big sombrero, trying to create as much shade as possible,” Sommerfield remembers. “He looked at a student and said, ‘You could use a sombrero.’ The student looked back at him and said that his house could use a sombrero, too.” And that conversation is how the home came to have the distinctive, sun hat-style roof that so defines, not only its look, but its climate performance. 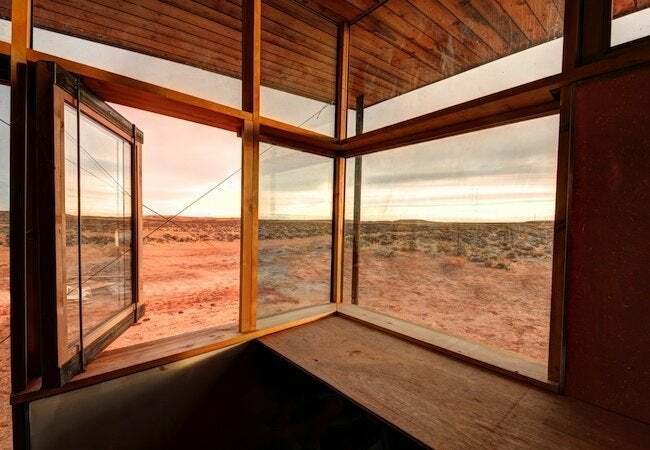 Of course, the house would sit on a site with splendid views of the famed Monument Valley. To enjoy the panorama, the Skow family wanted a front porch where they could sit in comfort and gaze out. They also hoped the house would respond to, and not always be in contention with, the challenging weather. Sifting through the kit and its materials, the students found a set of roof trusses and hit upon the idea of inverting them. Turned upside down, the roof structure would, like a sombrero, cool down the indoor spaces, while helping to create outdoor living areas shielded from the full force of the brutal sun. Meanwhile, in a way that signals the extent to which the house harmonizes with nature, the students slightly tilted the trusses so that the roof would collect rainwater, directing it toward a storage barrel. As the rain barrel refills with each storm, the Skows now have a supply of fresh water always at the ready. Below the roof, there are no superfluous features; climate considerations informed every design decision. For instance, glass comprises most of the southern exterior wall. And while the glazing affords views, it simultaneously performs the arguably more important role of maximizing heat from the winter sun. Cooling was equally important and here, too, the windows play a critical role by working to leverage the prolific desert winds. On the windward side, the windows appear low on the wall to catch as much of the moving air as possible. On the leeward side, they are close to the ceiling, allowing hot air to escape. “We just wanted the house to open up to the landscape, and be extremely efficient in its environment,” Sommerfield says. Fortunately, his students were brimming with ideas. J. Michael Welton writes about architecture, art, and design for national and international publications. He also edits and publishes Architects and Artisans.